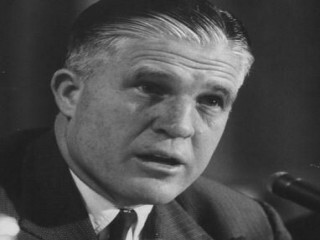 As president and chairman of the American Motors Corporation in the 1950s, George Romney transformed the U.S. auto industry by putting the first compact car on the market. Later, after serving as a three-term governor of Michigan, he was thrust into the national arena and considered seeking the presidential nomination in 1968. George Wilcken Romney was born in the Mormon colonies of Chihuahua, Mexico on July 8, 1907. He was the fifth son of Gaskell and Anna Pratt Romney. His father had a successful building business, and was considered to be one of the most prosperous businessmen in the community. Life for the family changed when Romney was five years old—a revolution erupted in Mexico. This event forced Romney's family to flee for their safety. His father sent his pregnant wife and five sons to safety in El Paso, Texas. Fortunately, there was only one skirmish with the rebels during their three-day journey in the hot summer sun. The senior Romney headed to El Paso to join his family. There, he was just another carpenter. The revolution forced the family to leave behind their comfortable home and way of life. After a brief stay in El Paso, they moved to Los Angeles, before continuing on to Oakley, Idaho and Rexburg, Idaho. The family eventually settled in Salt Lake City, Utah in 1921. Romney attended school and began working when he was around 11 years old. Between 1922 and 1926, he worked his way through Latter-Day Saints University, which was more of a high school than a college. When he was 17, he met the popular Lenore LaFount, who would eventually become his wife. Romney came from a family of athletes. Although he tried several sports, he was never the exceptional athlete that his brothers or cousins were. People remembered that he always tried his best. In the biography George Romney, Mormon in Politics, Clark R. Mollenhoff noted, "George Romney was simply the one who tried harder." Romney began a two-year mission to great Britian in the fall of 1926. He returned to the U.S. in 1928, and studied at the University of Utah. Romney was planning to move to Washington D.C. when his mother passed away. In his biography Romney, D. Duane Angel recalled the impact of her death on Romney, writing, "He took the remaining minutes of his last day in Utah to visit his mother's grave. Placing a flower before the stone, he knelt and meditated; then he promised his mother that he would make something of himself—that he would be a success." Arriving in Washington D.C., Romney enrolled in night classes at George Washington University and began working as a stenographer for Massachusetts Senator David I. Walsh. Later, he did tariff research for Senator Walsh. Through his tariff research, Romney met executives from Alcoa (Aluminum Company of America). They offered him an apprenticeship in 1930. He requested a transfer to the Los Angeles office, where he met his high school sweetheart, Lenore, who was working as an actress. He persuaded her to give up acting, and they were married in Salt Lake City on July 2, 1931. The couple had four children, Lynn, Jane, Scott, and Willard Mitt. The Romneys moved back to Washington D.C., where he was a lobbyist for Alcoa. As Richard C. Fuller stated in George Romney and Michigan, when he failed to receive a promotion that he thought he deserved, Romney accepted a position with the Automobile Manufacturers Association (AMA), to head their new Detroit office. He began the position in January 1940 and quickly became involved with the war effort. Romney was named general manager of the AMA in 1942. His brother Miles commented to Mollenhoff, "George accepted responsibility, was a good hard worker, and got along with people well, and he enjoyed being in the leadership of activities." As director of an auto industry trade association, Romney found himself in the midst of a booming industry. He often worked with, and testified before Congressional committees regarding war production, labor issues, and management methods used in the auto industry. In 1948, Romney's skill led several well-known companies to pursue him with job offers. In April, he joined Nash-Kelvinator, a company that manufactured automobiles and major appliances. He advanced rapidly and was named executive vice-president of the company in 1953. Romney helped set up the merger between the Hudson Motor Car Company and Nash-Kelvinator, which created the American Motors Corporation. The deal was finalized in the spring of 1954. Romney was named president, general manager, and chairman of the board of American Motors on October 12, 1954. American Motors was an independent car company competing against Detroit's "Big Three"—General Motors, Ford Motor Company, and Chrysler. Under Romney's leadership, American Motors developed a "compact" car that the "Big Three" did not have. Then, Romney went on the offensive. George S. May, author of Michigan, An Illustrated History of the Great Lakes State, stated, "Romney became a national celebrity when he attacked the gas-guzzling monstrosities that other car companies were producing in order to promote, with great success, the merits of American's small, more efficient Ramblers." The images that Romney created led to a successful marketing campaign. The company turned a profit in the first quarter of the 1958 fiscal year, its first since 1955. Romney sometimes found himself at odds with the labor unions. He believed in competition and opposed industry-wide bargaining for unions, which made him unpopular with members of the United Automobile Workers. At times he criticized union policies, but he did work hard to develop solid labor-management relationships. Finding success, Romney was once again ready to shift gears. In the late 1950s and early 1960s, there was a drive for a new state constitution in Michigan. Romney was one of the leaders of this campaign. A constitution convention was held and, as May stated it "propelled George Romney into the front ranks of Michigan political figures." May added, "Then, in a move more typical of nineteenth-century businessman, Romney turned from the business world to a new career in politics." It was not a decision Romney made lightly. On February 10, 1962, after a 24-hour period of fasting and praying, he announced that he was running for governor of Michigan. Two days later, he resigned as president and chairman of the board of American Motors. When he was elected to his first term of governor in November 1962, Romney officially severed all ties to the company. Michigan had what was called a "weak executive" form of government. The citizens elected the governor and seven other members of the executive branch to two-year terms. In the early 1960s, politics was considered a dirty word in Michigan. Romney, according to May, "exuded a sense of dedication and self-confidence that had served him well as a business executive." He was described by May as being a "rugged, vigorous individual and effective vote-getter." Romney was running against an incumbent governor, John Swainson, who was described as "ineffective, lackluster, and colorless" by critics. There was a series of debates between the incumbent Governor Swainson and Romney. The first debate was not televised, but the other three were. During the first debate, Fuller noted "it was obvious that Romney was the favorite from the start." A local newspaper, the Ann Arbor News, offered this perspective in its June 21, 1962 edition: "There is no doubting Romney's sincerity, integrity, and personal dynamism." The newspaper added that he was "leaving the impression that he doesn't fully understand the difference between running a large business corporation and presiding over a state government." Another key element of Romney's campaign was that he was the first Republican gubernatorial candidate in Michigan who made an effort to attract the African-American vote. Traditionally in Michigan, the Democrats and unions cultivated the African-American vote, while Republicans did not. Romney had a young African-American staff member who "had the assignment of dealing with the civil-rights issues," and played an important role. Although new to the political scene when he took office, May observed that Romney was soon acting like a seasoned professional. "His staffers called him Mr. Romney." Those who smoked or drank respected his religious beliefs and did not do so in his presence. He thrived on door-to-door campaigning. Romney was considered to be a family man, and as Fuller noted, the "wholesome family image proved to be a great asset to Romney's candidacy." His second gubernatorial campaign would be different for three major reasons: he was now the incumbent; it was a presidential election year; and in the minds of many Michigan citizens, the state had dramatically changed for the better. However when Romney refused to support Republican presidential hopeful Barry Goldwater, many wondered if Romney would seek the nomination. On January 8, 1964, the Detroit News, published an editorial called "Count Us Out!" Martin Hayden, editor of the paper, made it clear that they would not support Romney for the presidential nomination. Hayden stated in his editorial, "We will support Governor Romney in his announced objectives for the people of Michigan. If he abandons those sworn objectives for a chance at the presidential nomination in 1964, with the Michigan governor's office as a launching pad, count us out." Republicans were trying to present a united front so they could win the White House from the Democrats. Romney did not help the situation by stating to a Goldwater supporter in California, "I am neither supporting nor opposing any candidate." In the end, the Democrats retained the White House, and Romney won his second term as governor of Michigan. Romney was re-elected in 1966, and it was obvious to many that the 1968 presidential nomination was a strong possibility. At his gubernatorial victory party in November of 1966, the crowds chanted, "Romney is great in 68!" His administration continued to make changes in Michigan. He modernized the state tax structure. The state's first income tax and other new taxes were enacted in 1967, which enabled Michigan to increase spending for education, mental health facilities, welfare programs, and other government program. May stated, "By emphasizing the provisions of the new constitution that were designed to provide more efficient governmental operations, Romney was able to place himself and the Republican Party in the role of innovators seeking needed improvements, while Democratic opponents of the constitution were pictured as selfish nay-sayers." Romney was considering the 1968 presidential nomination, but called being the governor of Michigan "a priceless experience." His friend, and fellow state governor John H. Chafee, stated, "The Republican Party, but even more the nation, has reason to be grateful that a man of George Romney's ability, energy, and integrity is willing to come forward to serve the people. His is the leadership we need on a national level." Others considered him an outside shot at best. But while on the television program, "Meet the Press," on October 15, 1967, Romney countered with, "I'm used to being an underdog. I've been an underdog in everything I've gone into of consequence throughout my life." In the end, two events kept Romney from making a serious run for the white House. May wrote that Romney "probably forfeited whatever chances he may have had of gaining the Republican presidential nomination in 1968 when he alienated many in his party by coming out against the [Vietnam] War." May continued that "earlier, in the summer of 1967, Romney's political hopes had been damaged by riots in Detroit." Property damage reached at least $50 million. Governor Romney, Detroit's mayor, and President Johnson, were all criticized for their reactions to this tragedy, which had an adverse effect on their political careers. Romney served as secretary of housing and urban development in the cabinet of President Richard Nixon during his first term in office. In 1972, Romney formed the National Center for Voluntary Action, an organization that encouraged involvement in public affairs. He then retired from public life. Romney was a life-long member of the Church of Jesus Christ of the Latter-Day Saints, and held high positions in the church. He never graduated from college, but received many honorary degrees. In 1994, he campaigned for his son Mitt, who was running against Senator Ted Kennedy in Massachusetts. Romney died at his home in Bloomfield Hills, Michigan, on July 26, 1995. Shortly after his death, People magazine wrote that Romney "was a reformer before reform was cool. He was very serious about budgets and taxes, but he also had a real passion about trying to make government help people who needed help." View the full website biography of George W. Romney.